On a recent trip to Scottsville we stopped into Sugarleaf Vineyards, a boutique winery located in the heart of the Monticello Wine Trail. - producing wines from primarily estate grown vinifera grapes. 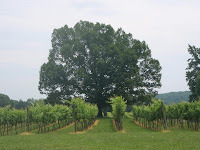 I would recommend visiting their website to read about the winery's history, but in brief, Sugarleaf Vineyards is owned and operated by Jerry and Lauren Bias. They initially purchased the property as a retreat - future retirement home, but after consulting with vineyard experts from the university of Virginia, they found that there 126 acres were ideally suited for grape growing. They initially intended to source the grapes to other vineyards, but soon realized that the property was producing high quality vinifera grapes; thus, why not make wine instead. 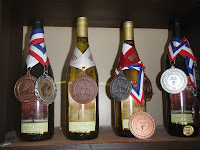 The first vintage was available for sale out of the tasting room in 2007 and already most of the wines have been awarded medals at several national competitions. We arrived to find winemaker Daniel Neumeister preparing the Chardonnay and Viognier tanks for a bottling session scheduled for the next morning. We learned at this time that last year's vintage of their Viognier had sold out in 4 months, so they were eager to bottle this year's production. In addition their Petit Verdot was also gone - consumers are starting to discover Virginia's top grapes. We had to settle with the rest of their portfolio, which consisted of a Chardonnay, Petit Manseng, Cabernet Franc, Cabernet Sauvignon, Vidal Blanc, and the Neubia Nectar, a dessert wine made from 25% Petit Manseng and 75% Vidal Blanc. All the grapes were grown in the estate vineyard except for the Petit Manseng which was sourced from White Hall Vineyards. In general, the wines were very good - our favorite was the Petit Manseng - I guess always searching for something unique. The Chardonnay was more fruit than oak; the Cabernet Franc a nice medium bodied wine; and the Cabernet Sauvignon a full bodied wine and not bad for a grape that normally struggles in the Virginia climate. For those with sweeter tastes, the Vidal Blanc comes in at 1.1% r.s. and possesses a typical characteristic of this hybrid: floral aroma and peach flavors. Obviously Mr. Neumeister knows his craft and we have no issues with the wines themselves. The problem we had was the cost of the tasting. First, Sugarleaf's wines are expensive ranging from $24 to $30, excluding the Vidal Blanc. There is obviously a market for Sugarleaf's wines, since they sell out quickly; Charlottesville is a wealthy area. Sugarleaf also charges a hefty tasting fee. Now, we fully understand the argument why wineries charge tasting fees - particularly when the winery will most likely be able to sell their stock within the year. Since the winery must pay an excise tax on each bottled wine, if they don't sell the wine, they must eat the tax. As a result, most wineries charge a modest tasting fee that is usually waived if the taster purchases a bottle. That is not the case at Sugarleaf Vineyards. 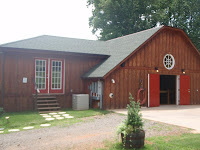 The tasting fee is $6, so for two of us, it costs $12 to just enter the door and taste the wines. When we travel to a winery, we want to support the industry by purchasing at least one bottle, and here we decided to purchase a bottle of the Petit Manseng. Thus we paid basically $40 for a bottle of Virginia wine. For those who regularly tour wineries, is it worth the cost to drive 3 hours to pay the equivalent of $40 for a bottle or $12 just to taste the wine? Some of you may reply with an emphatic, YES. For us, I'm starting to think its not worth the effort. We just received an email announcing the winners of the 2009 Indy International Wine Competition and there are several surprises. Congratulations to one of our local wineries, Barrel Oak Winery, for their Norton and to Stone Hill Winery for their Vignoles. I sampled this wine several times over the course of a year's travel to Kansas City; its good. And its nice to see Zinfandel get recognized. 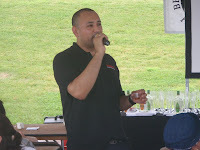 The world's best bourbon was on display at the 2009 Beer Bourbon, and BBQ at National Harbor, as well as Tennessee whiskey, rye whiskey, rum, tequila, and cognac. Then there was beer - from local brewers to California and all the way from Thailand. If that wasn't enough, there were informative seminars regarding these products as well as music and an entertaining bean eating contest. But for us, the focus was bourbon - and what a selection. 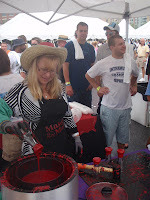 We started at the Maker's Mark tent where a long line had already formed to have their glasses dipped in the trademark red wax. We had just received our Maker's Mark Ambassador cards in which we will post soon on the perks associated with this membership - plus updates on our personally labeled bourbon barrel. But getting back to the Maker's Mark, the distillery really produces a unique bourbon based on its grain composition and warehouse strategy. Moving on, most of the major premium brands were represented: Blantons, Bakers, Bookers, Hancock, and Elijah Craig. Our all time favorite, Black Maple Hill was not available - but our next two favorites Pappy Van Winkle and Old Rip Van Winkle were. On a good day, a single Blanton's would be compeltely satisfying, but on this glorious afternoon we went nuts. 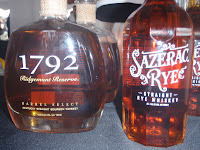 Many of the brands are hard to find, 1792 Ridgemont Reserve, Noah's Mill, Rowan's Creek, and Rock Hill Farms to name a few. That's the beauty of this festival - if you find a jewel, get your local supplier to order it. Unfortunately - or fortuinately - we didn't even get through the entire selection of bourbons or even to the Jack Daniel premium whiskeys. Copper Fox Distillery. Rick Wasmund has been producing an interesting Single Malt Whisky for number of years now out of his Sperryville Virginia distillery. The interesting flavor is partly the result of using apple and cherry wood chips, along with oak, to smoke the malt. We have learned over the years to add at least a drop of water to a glass to enhance the aroma and deaden the alcohol and we learned that Mr. Wasmund explicitly produces the whisky to that affect. For that's how he normally likes his Scotch. 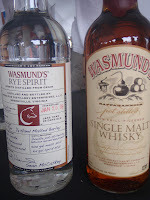 As an added bonus, he was pouring his latest creation: Wasmund's Rye Spirit. Basically rye grain alcohol, no barrel aging, but remarkable smooth. However, he recommends using this spirit as a blending agent, as in a Bloody Mary. And look out for a future Single Barrel Whisky - coming in a future release. One a final note regarding spirits, the promoters organized a series of excellent seminars designed to give attendees a rudimentary understanding of Tequila, Rum, Cognac, and Bourbon. We hope to publish a similar series, starting with Tequila after we have a chance to discuss the topic with Jaime Salas, National Tequila Ambassador. But it was nice to have other spirits represented, particularly the Cruzan Gold - I needed a taste of the tropics. Because of our fascination with bourbon, we were not able to concentrate adequately on the many outstanding beers. We didn't even bother approaching some of our favorite brands - the Clipper City and Heavy Seas brands; the Sierra Nevada ESB and Summerfest; Dogfish Head Raison D'etre and 90 Min IPA; and the Pyramid Hefeweizen. Instead we sampled brands we had never tasted and found a few worthy to compare to those above. Particularly the Belgium style beers from Brewery Ommegang. The Ommegang Witte Ale is unbelievable; the quality of an import but at a lower price. Our new summer beer. This was by far our favorite and we probably overstayed our welcome sampling over and over and over again. Look out Cooperstown, a road trip is coming. 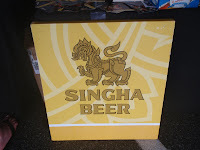 From out of Thailand we sampled Singha Beer, a lager beer made from barley but with a little hopiness for this style. I, ts a refreshing beer, with a touch of sweetness. Wonder how it pairs with spicy Thai food? That's probably easy to find out since this beer is currently only available in Thai restaurants; but they hope to expand distribution to beer stores in the near future. Moving closer to home, we found a replacement to our Topper's Hop Pocket that has gone AWOL since the days of Old Dominion Brewpub. 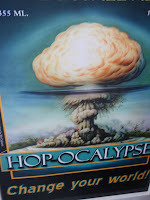 Clay Pipe Brewing Company, from Westminster Maryland, produces a hop infested Hop-Ocalypse India Pale Ale. The beauty of this beer is that the hop characteristics are refreshing and not overly bitter. Like the Hop Pocket, this beer is versatile - good with lunch or just to guzzle after mowing the lawn. Another local brewery we discovered was Delaware's Evolution Craft Brewing Company. They brewery is only a few months old but they already have a nice Pale Ale. Plus they are practically on the route to Ocean City - just deviate a little north of Salisbury and purchase tax free beer. Sales tax that is. And finally there was a nice English style brown ale from Lake Placid Brewing, the UBU Ale. This beer was refreshing even with the heat. All in all, the Beer Bourbon, and BBQ festival series is worth every cent - whether held in Maryland, Virginia, or elsewhere. The only complaints at this event was the result of holding the event in a parking lot, the asphalt gets hot, and the long lines for the bbq. Otherwise, we look forward to next year's sampling of fine bourbon and beer. Here are a few local festivals and events that we plan on attending this summer. You can suggest events that we should attend in the comments section. The Floyd Fandango Beer and Wine Festival! Seth Fromal - Live Music! On June 6th, we attended the The Food & Wine Festival at National Harbor® with a twist, accompanied by a four year old. This is one of the few such festivals that even allow children and in fact, actively court them, by providing content specific seminars for youngsters. Good for them. Oh yea, there's still plenty of food, wine, beer and spirits for the adults. We started the day talking to the Mar-Del Watermelon Queen, Jessica Leigh Haden, while sampling the fruit, then headed directly to the end of pier. Better to start in the less crowded rear and work our way forward. At least that was the plan until we saw the Belgium beer display and couldn't pass up a glass of Leffe. Then the Paint Branch Ramblers started playing and before long it was time to rush to our first seminar, "Watermelon Strawberry Smoothies". For the next hour we sat with a couple other parents and a hoard of youngsters watching Ms. Haden and Bravo's Top Chef contestants Carla Hall and Ariana Duarte provide an entertaining session on smoothies. And yes, it was very entertaining and informative. We no longer our hostage to the expense Edible Arrangements and our boy now asks for smoothies instead of popsicles. We trekked back to the entertainment area to listen to Sam’O and the band JFC and have another beer, this time a Hoegaarden. Not for too long. We had to head back to the seminar area for the Peanut Butter Apple Spread and Breakfast Raisin-Banana Roll-ups and picture time with Buddy McNutty. I kid you not. Actually it was a nice session, a little smaller than the first, but just as informative. Sloppy food, but good; and comic books as a bonus. They came in handy at the Robert Mondavi display. This time on our return trip to the entertainment area, we stopped to discover the excellent food offered by the vendors. Chili, mussels, carrot soup, gazpacho, cakes; the list goes on. Now this is a food festival; unlike a similar sounding event hosted downtown. Even the simple Giant\Nature's Promise display of chips, cheese, and tea was a hit. So was the Discover Rums of Puerto Rico. While loitering around their tent, we met several others that preferred the Don Q Anejo neat. Cheers. By this time, members of our party were getting a little weary. We decided to skip the Decorate your Chef Hat seminar and instead spend a few minutes at the previously mentioned Mondavi display. Their Fume Blanc was much better than I had remembered, as was the Cab. That was it. No wines tasted, definitely a first. Sorry Trefethen Vineyards, Michael & David Phillips Vineyards, Charles Krug Winery and locals: Fabbioli Cellars, Loudoun Valley Vineyards, Tarara Vineyard & Winery, and Boordy Vineyards. We will see what our companions have to report and make sure you visit Dezel at My Vine Spot - he will have excellent analysis of the festival and wines. Finally, we applaud the organizers of the The Food & Wine Festival at National Harbor for not only allow children but providing entertaining events targeted towards them. And thanks to the Peanut Board, Ms. Haden, Ms. Hall, and Ms. Duarte, and the other seminar hosts for providing the entertainment. We usually chuckle when we read about a winery's sustainability practices, assuming the worst - a terrible marketing gimmick. But that is definitely not the case with Paul Dolan and his influence at Paul Dolan Vineyards and Parducci Wine Cellars. In 2004 Dolan and several members of the Thornhill family purchased Mendocino's oldest winery - Parducci, which was founded in 1932 - and formed the Mendocino Wine Company. He incorporated the ground breaking farming techniques that he developed at Paul Dolan Vineyards and along with other innovations has helped Parducci to become "America's Greenest Winery" and the first carbon neutral winery. Take that Oregon. Now, we only care about the carbon neutral aspect because its a good business practice to conserve energy; but the other vineyard and winery are revolutionary. For instance, the company vehicles have been refitted to use recycled restaurant oil as fuel - now that's back to the future. In the vineyard, animals take over for pesticides and artificial fertilizer. Birds and chickens control insects whereas owls and raptors control small rodents. Bees pollinate wild poppies that act as vineyard cover and goats control weeds as well as provide fertilizer along with neighboring cows. The proprietors also created a wetlands surrounding the winery that handles waste water by absorbing metals and sugars. Add in water conservation and recycling programs, solar and wind power, and other practices and its easy to see how that they moniker, "America's Greenest Winery" is not far fetched. 2008 Parducci Sustainable White. Both retail for about $12, but don't be mislead. The Pinot Noir was fantastic, creamy with hints of chocolate - resembling a Burgundy wine more than the nearby Russian River version. The flavor is black cherry - but the finish is cream - as you can guess - extremely smooth. The Parducci Sustainable White is naturally a refreshing wine made from five grape varities - starting with Chenin Blanc and Sauvignon Blanc and ending with smaller percentages of Viognier, Muscat Canelli, and Tocai Fruiliano. What's not to like about this combination. The result, a floral aroma from the muscat, clean citrus acidiy from the blancs, and some depth with the Viognier. The Tocai Fruiliano? Don't know. Does it matter; this is a good summer wine. The Paul Dolan Vineyards brand consists of five organic wines and one Biodynamic, the Deep Red. We learned that organic wines are those in which the grapes were grown using certified organic practices with no sulfites added. Biodynamic is more complicated with the vineyards certified to follow the Demeter standards as well as the teaching of Rudolph Steiner. Finally, the winery must be Biodynamic certified to follow the practices of Demeter. From this brand we sampled the 2007 Paul Dolan Chardonnay, made from old vine Chardonnay. Actually the vines are close to 40 years old planted on two properties: "a cool-site vineyard north of Lake Mendocino and a warmer-site vineyard near the Russian river in Hopland". Three quarters of the wine is then fermented and aged in French and American oak for 8 months; the rest in stainless steel. This recipe imparts the standard Chardonnay flavor with a slight vanilla finish. A nice wine and at $18, very affordable. We can't wait to get our hands of the rest of their portfolio. These are good wines priced at our level. We may have to drive through Sonoma and Napa on our next trip West and take a look at these revolutionary vineyard practices. And for those that can't visit, you can read more about organic farming and sustainability at the Mendocino Wine Company and Paul Dolan Vineyards websites. This weekend, June 6th and 7th, we will getting our first look at National Harbor® by attending the The Food & Wine Festival. National Harbor is located south of Washington D.C., right on the Potomac River (1 1/4 miles worth), with water taxi access from Alexandria. This is the second year for the The Food & Wine Festival at National Harbor and it "celebrates the chefs’ use of local, fresh and responsibly sourced ingredients from both land and sea". As for local wines, so far it looks as if Virginia will be represented by Loudoun County wineries through DC's Wine Country and Maryland by Boordy Vineyards. During both days expect to see several cooking demonstrations by local chefs, seminars on food pairing with wine and beer, and of course, a grand tasting area. We have also listed below the live music schedule. This event should be just as fun as the similar wine and food festivals in New York and South Beach. In particular, we are looking forward to three visiting the Robert Mondavi Discover Wine Tour, the Discover Rums of Puerto Rico, and the Belgium Beer display. At the Robert Mondavi station, they will be providing several wine and cooking seminars. At the New York Wine & Food Festival, the Discover Rums of Puerto Rico was the most entertaining display. They play great Latin music (ask for a CD), while serving rum infused drinks, or neat, for those like us that want to savior the spirit. We also learned that Puerto Rico is home to other distilleries other than Bicardi, primarily Don Q and Barrilito. Make sure you try the Don Q Anejo or Don Q Grand Anejo. Finally, who can resist Belgium Beer. Besides hosting a beer garden, there is also a seminar scheduled titled "Savouring Perfection — A Celebration of Belgian Beer and Food: Join Stella Artois' Brand Ambassador Bart Vandaele for a one hour celebration of Belgian beer and food culture". Share your experience inthe comment section below. See you at the The Food & Wine Festival at National Harbor.